Them’s fighting words and, being a) a man, b) in the UK and c) waaaay older than 18 (weep), I thought I’d give it a go. Guess what? I’m connected to three Paddy Power fans. Turns out that hot air wasn’t nearly hot enough. The important thing, though, is that Paddy Power aren’t simply sitting back on their laurels and enjoying their place at social’s top table. It’s not enough for them to have over a million people listening to them on Facebook, they’ve got people talking about them, too. In fact, if you compare them with other brands who have similar a number of Fans, they generate six times as much conversation as Costa Coffee, 48 times as much as Pringles and 83 times as much as Blackberry. And Blackberry are in the conversation business. All this is because, 18 months ago, Paddy Power totally reassessed their growth strategy. As underdogs, they were in no position to compete on level terms with the likes of Ladbrokes and William Hill. But what they could do was to start, as they described it themselves, “listening to what the punters have to say and reacting in real time to damn well entertain.” The “We Hear You” campaign was born, where every action, every ad, every viral video was developed in response to customers’ posts on their Facebook page, or as a reaction to previous social media stories. The results? A 2000% growth in their social footprint, making them by far the more successful social player in their industry. This month, they’ve taken that even further, using their singular voice to do more than simply engage their audience. Now they’re trying to help shape that audience’s attitudes, teaming up with the gay rights charity Stonewall to tackle the issue of homophobia in football, at all levels of the national game. 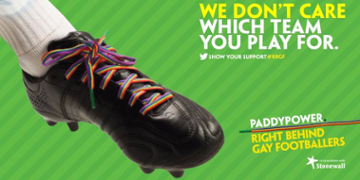 The campaign (a Twitter phenomenon) has already captured the support of everyone from Stephen Fry to Ed Milliband and looks set to make a genuine difference as superstar footballers embrace the concept and wear rainbow-coloured laces in support. But let’s not forget that Paddy Power is a business, and a shrewdly-managed one at that. That’s why the true destination for Paddy Power’s social juggernaut is something entirely different. It’s not just a question of engaging its audience, nor even of influencing that audience, it’s all about getting that audience spending. 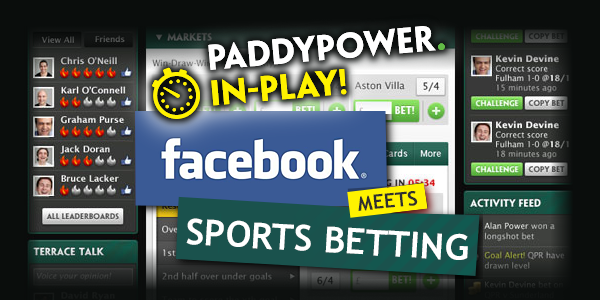 Paddy Power’s forthcoming In-Play Facebook app is slated to become the social network’s first ever real-money sports betting product, and we think it’s a game-changer. Make no mistake, this isn’t a nice-to-have – it’s a bold play to streamline marketing spend, increase customer acquisition, grow share of wallet and foster increased loyalty and repeat business. As the MD of Paddy Power Online, Peter O’Donovan, recently confirmed, this app is all about growth and profitability – and that’s a million miles from the touchy-feely ghetto to which many feel social engagement should be confined. A user’s interactions with their own friends are always going to be more compelling than the transactions they have with a brand. That’s why surfacing those friends as often as possible and facilitating touchpoints between users is pure social flypaper. In your head, you’re challenging your friend Kevin, and challenges are free. But Kevin hasn’t asked you to challenge him, Paddy Power has – and it’s the brand you’re really engaging with here. Clever stuff. Here’s where Paddy Power have learned from Q&A sites like Yahoo! Answers, Quora and Stack Overflow, where there’s an elegant balance between experts and novices. Each element requires the other’s presence to benefit: the novices need the experts so they can learn and improve, while the experts need the novices to tickle their egos. Achieving the right blend can lead to phenomenal levels of product ‘stickiness’ (up to 75 minute session times) and engagement. Notice the leaderboards and awards: these are all about driving repeat visits and user immersion. It’s one thing to take part, but it’s another thing altogether to win, and this kind of friendly competition is pure rocket-fuel when it comes to Social-Commerce (and, let’s make no bones about it, Paddy Power’s In-Play Facebook app is absolutely an example of Social-Commerce). We’re also excited about the possibility of mini-leagues where users can compete against their real-world friends – the ultimate acquisition driver – though it would appear that Paddy Power’s development team have a little more work to do to fully flesh this out. We’ll be watching this space. Then, there’s chat functionality, signifiers of the number of people taking part and activity feeds – all of which cumulatively make the user feel as though they’re engaging in an activity with other people. It can be a cold and lonely world online (which is one of the reasons why going shopping with your friends in the real world is still more rewarding than buying things on vanilla E-commerce sites) but, once you start flashing signifiers of community, our flocking instinct takes hold and people start to feel much more comfortable. All this, plus full integration with Facebook’s newsfeed (generating even more touchpoints to pull both existing and new users into the app) bodes very well for the project, but we do have one or two caveats. By placing so many eggs into Facebook’s basket, Paddy Power run the risk of siloing their community. Facebook’s a giant, for sure, but true Social-Commerce needs to have tentacles reaching out into all kinds of networks and communities. We’d certainly like to see more integration with the likes of Twitter, Pinterest (surprisingly more popular with men than with women in the UK) and LinkedIn. 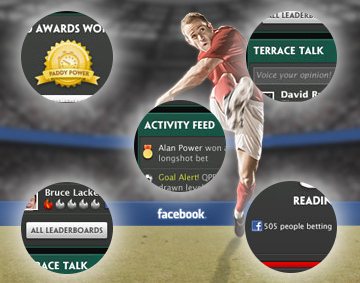 Remember, work-place competition was a key driver for Fantasy Football leagues, and tapping in to those pre-existing communities could work wonders for Paddy Power’s app. Secondly, although we applaud the use of soft ‘awards’ – à la Foursquare – we feel this could and should be upgraded to real-world rewards. The traditional acquisition model for online gaming is, quite frankly, broken. We recently spoke with the CEO of a very well-known betting brand who was rightly lamenting the proliferation of free bets to fish for new customers. Unsurprisingly, crude incentives like this simply don’t engender loyalty – customers come, take the freebie, then scurry away to the next hand-out on offer at the site down the virtual road. That’s why, instead of offering de facto free £50 bets to all new users, Paddy Power should reward participation in the app – and their ecosystem – with betting credit. If users have to work for their gifts, they end up becoming much more engaged and much more inceitivised to tell their friends and act as advocates for your brand. So, a bright start for Paddy Power, with lots of potential to get better and better (pun intended). The question is, though, what will the rest of the industry do to catch up and compete? Paddy Power have already assigned 25 employees to this project – a massive investment – and they’ve committed to investing even further as they see success. If they’re not going to get dangerously left behind, their rivals urgently need to find ready-made solutions to help them compete in the Social-Commerce space. Here at Buyapowa, we’ve already helped household name brands such as J&J, Sony and Tesco become Social-Commerce innovators, incredibly quickly and very affordably thanks to our state-of-the-art platform which turns social audiences into transactional customers. We’re ready to help you too.